UK extreme metal veterans Cradle of Filth will make their return to North America with a headlining tour this March/April. Opening the tour will be Ukraine metal band Jinjer. 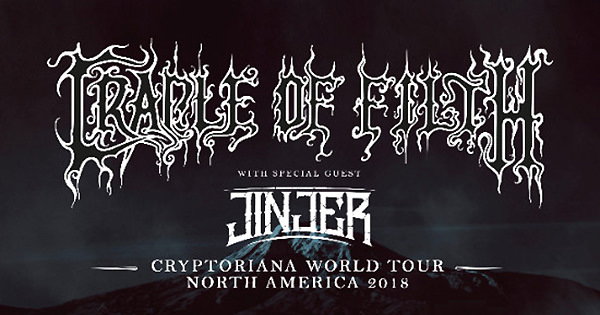 "Cradle of Filth are very much looking forward to the U.S/ Canadian leg of the Cryptoriana World Tour," says vocalist Dani Filth. "Even more so now that we have just finished the extremely successful UK run, and with a huge European run ahead of us the band will be totally up to speed, firing on all cylinders and playing a cool, yet eclectic set from the new album and beyond (the extensive 'Bathory Aria' from Cruelty And The Beast now being a firm fan favorite). So get ready for nights of insane gothic horror and vehement perversity come the cusp of April, when Cradle hit the States where it hurts."